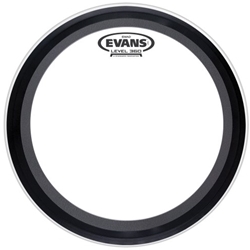 Evans Drumheads has been in the music industry for more than 40 years and pioneered the original plastic drumhead in 1956. These weatherproof heads changed the drum world forever. Evans' state-of-the-art manufacturing facilities in Farmingdale, New York, produce heads that are unparalleled in consistency, durability, and sound quality. Evans is looking to the present and future needs of drummers worldwide. Trust Evans Genera heads to deliver smashing tone!